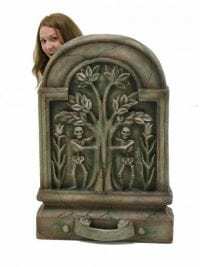 This gravestone is double sided (as shown) and decorated with a cherub, scrolls and a skull, so can be used to great effect at your Halloween or Hell themed event or party to create a spooky scene! 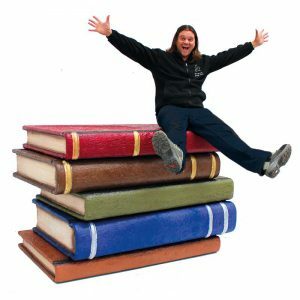 Check out our other grave tombstone options below. Giatn 3D Caudron Prop to hire. Don't get too spooked by our giant Witches Cauldron that is available for you to hire! 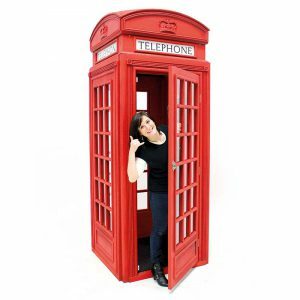 It even has a hole in the bottom which means that you could use a smoke machine to create a spook-tacular atmosphere (available to hire separately)! 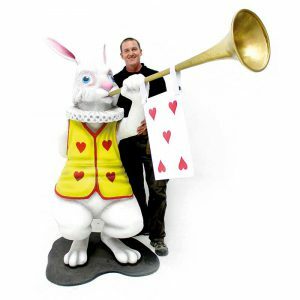 Perfect for any Halloween or fairytale themed party event. 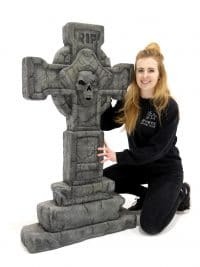 Giant freestanding creepy crucifix tombstone. 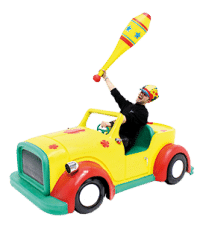 1 of an available 5 set. 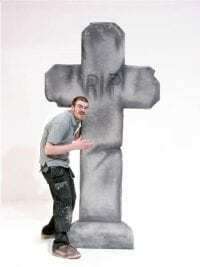 Giant 3D RIP Tombstone to hire. 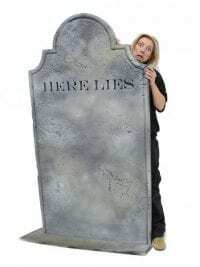 This giant headstone will help to create a truly creepy atmosphere at your Halloween or Hell themed event. 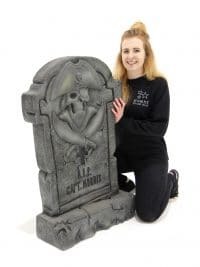 Hired either on its own or alongside more of our giant head stones or our smaller gravestones, it will really help to give your event space a truly spooky feel. 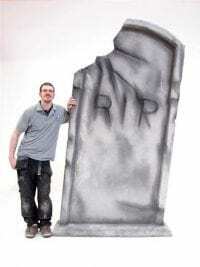 Giant 3D Tombstone available to hire. 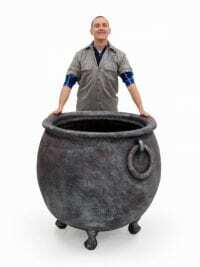 Giant Halloween Cauldron to hire. Don’t get too spooked by our large Witches Cauldron that is available for you to hire! It even has a hole in the bottom which means that you could use a smoke machine to create a spook-tacular atmosphere (available to hire separately)! 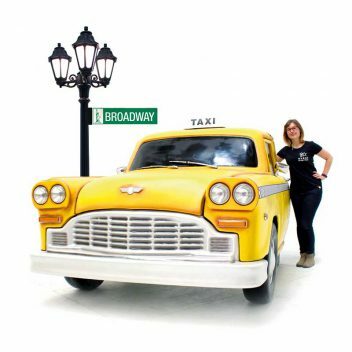 Giant 3D Tombstone to hire. 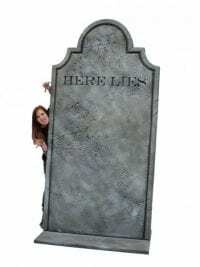 Giant 3Dd Tombstone for hire. 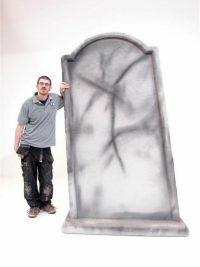 This giant headstone will help to create a truly creepy atmosphere at your Halloween or Hell themed event. 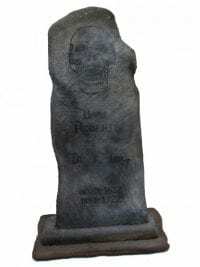 Hired either on its own or alongside more of our giant head stones or our smaller gravestones, it will really help to give your event space a truly spooky feel! Human or Animal? 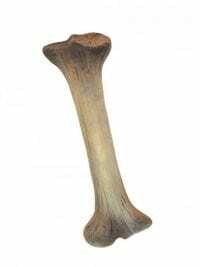 These ultra realistic large bones are perfect filler items for your Jurassic, Halloween, Apocalyptic or Animal themed event. 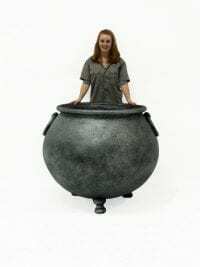 Large Witches Cauldron for hire. 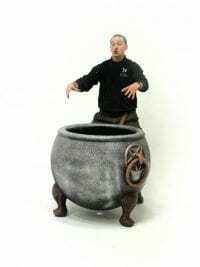 This Witches Cauldron is a must have for your Halloween Party. Please note that the design of each of our cauldrons may vary slightly. Human or Animal? 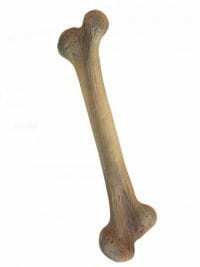 These ultra realistic medium bones are perfect filler items for your Jurassic, Halloween, Apocalyptic or Animal themed event. 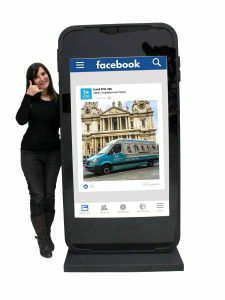 Check out our Medium Headstones to hire! 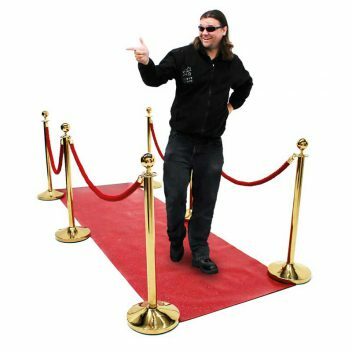 These will help to create a truly creepy atmosphere at your Halloween or Hell themed event. 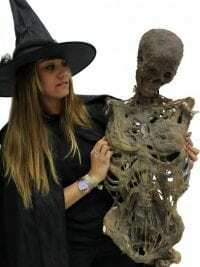 Group them together or scatter them around your event space to give your event or party a truly spooky feel. 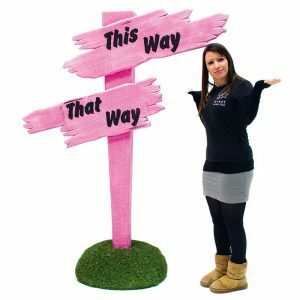 Please note that our gravestones come with a variety of inscriptions and styles and Event Prop Hire cannot guarantee which you will receive. Don’t get too spooked by our witches cauldron that are available for you to hire. 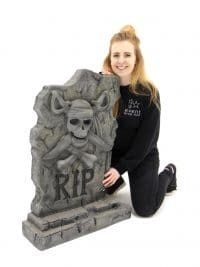 This tombstone is double sided (as shown) and decorated with skulls and skeletons so can be used to great effect at your Halloween or Hell themed event or party to create a spooky graveyard scene! 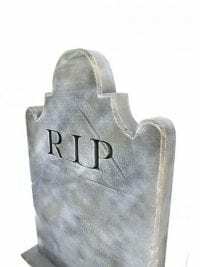 Check out our other grave stone options below. Please note that the price quoted is for one Ornate Headstone only. 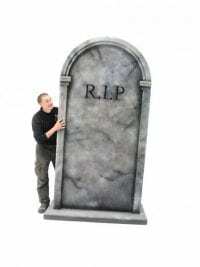 Please note that the hire cost is for one tombstone and sizes may vary slightly. 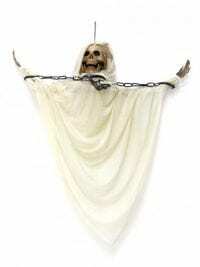 Hanging Skeleton Prop to hire. 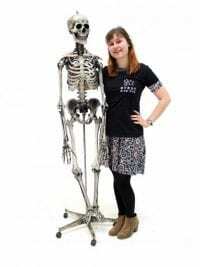 The skeleton is supplied with a stand on wheels and is a great prop to hire for any Halloween or Pirate party or event. 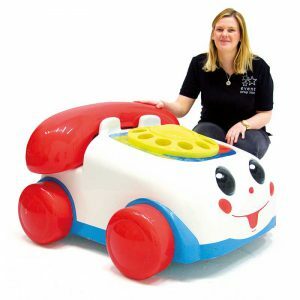 If you like this, why not hire in conjunction with our cage! 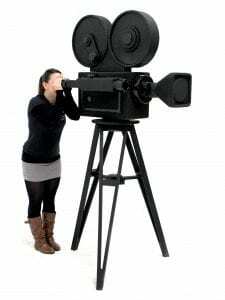 Please note that the rental price quoted is for the hire of one skeleton prop. 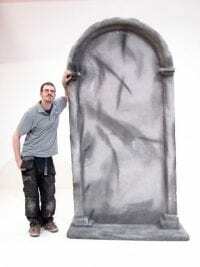 Stone Effect Coffin for hire. 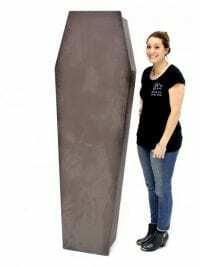 This coffin will look amazing hired with some of our gravestones to create an ultra-realistic grave yard at your event or party. 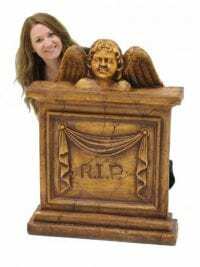 And even better, the lid of the coffin is removable so your guests are welcome to lie inside the coffin for a freaky photo opportunity! 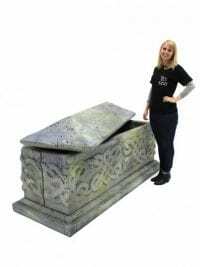 Stone effect sarcophagus to hire. 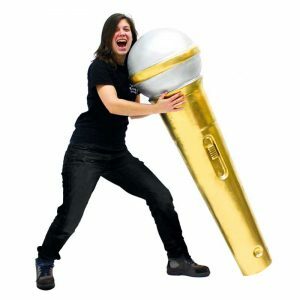 Suitable for any Medieval or Halloween themed party night event! 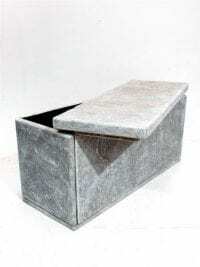 Our stone effect sarcophagus has a removable lid allowing items (or bodies even!) 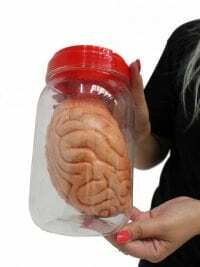 to be stored inside it! Prop breaks down into six component pieces and is secured together with simple wingnuts. 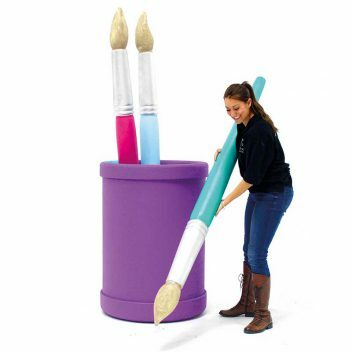 No tools necessary. A real life wooden coffin crafted by our master carpenter! 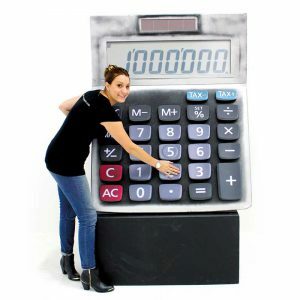 No need to worry about the last nail in the coffin of your event when you hire this authentic prop! 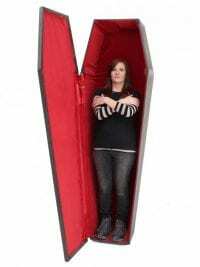 Please note that we have a few different designs of coffin so what you receive may vary from the picture shown. They are all great though so don't worry! Please note that these coffins do not open and style may vary slightly. Fully opening and lined Toe Pincher Coffin for hire. The coffin opens and is lined so why not hire it with our Skeleton Prop (HLW15) and create a truly creepy scene!